EN Summary: In spite of the jacket’s base pattern being already proofed and fitted, I found it necessary to construct another muslin mainly because I wanted to check if the collar extending from the center front panel works and if I like its final shape. I also took the chance to check on the pocket size and placement at this stage. 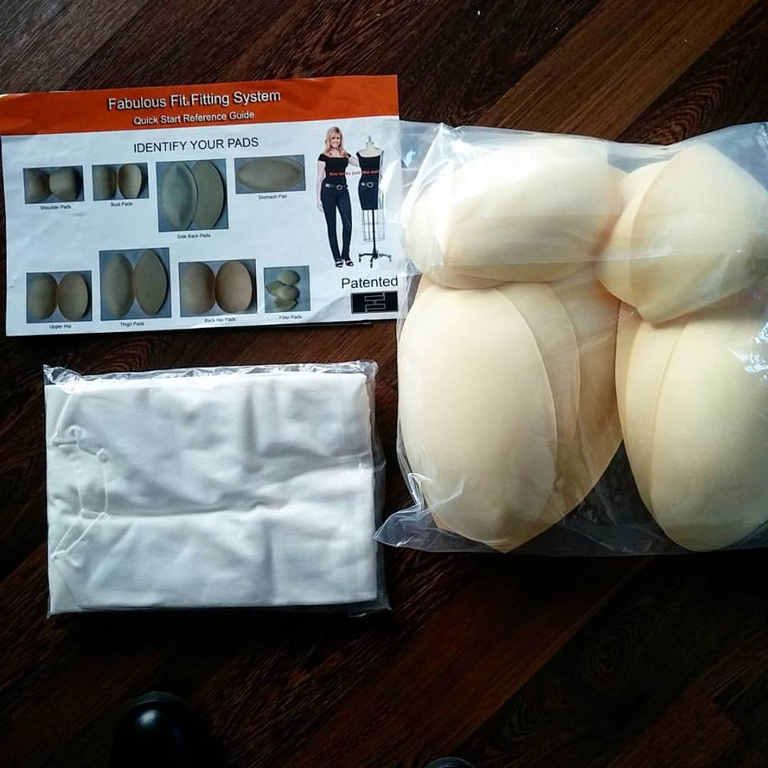 In this article I also share my experience with the Fabulous Fit Fitting system. 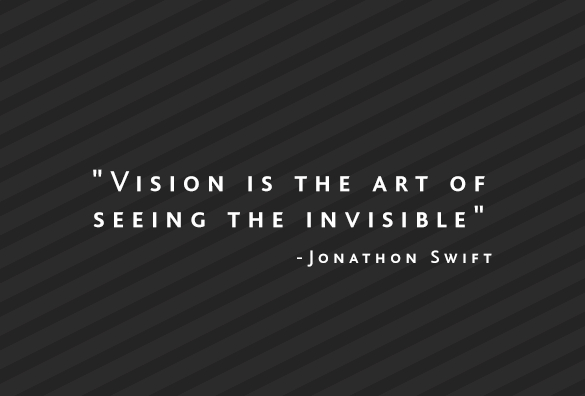 Continue reading to find out more. PT Sumário: Apesar do molde base já ter sido provado e ajustado, achei necessário fazer um novo modelo de prova, principalmente para ver como fica a gola redesenhada que se estende do painel central da frente e para fazer algum eventual ajuste à sua forma. Também aproveitei para verificar o tamanho dos bolsos e o seu posicionamento. Neste artigo também partilho a minha experiência com o sistema de acolchoamento de manequins Fabulous Fit. Continuem a ler para se inteirarem de tudo. EN: This set consists of two dressform covers and several special purpose pads to customize your dressform. There are pads for the shoulders, chest, abdomen, side back, hips and buttocks, along with some filler pads for extra volume. I started by regulating my dressform for its smaller size, took exact measurements of my body and started placing the pads at the same time as I was rolling down the first cover which secures the pads in place. I used an old pair of shoulder pads placed the other way around just to raise the bodice height at the shoulders and then placed the shoulder pads that came with this set on top, slightly rotating them forward to mimic my posture I worked my way through from top to bottom, positioning the bust pads and adjusting for their correct height and spacing, etc, always checking with my own body measurements. When I was happy with the padding I added the second cover which has the princess lines and keeps it all together even more securely. The process took about 40 minutes to complete and I think I did a pretty good job. EN: Right in the first photo you can see how the collar turned out: I will have to add a facing, either partial or just another center front panel. I am happy with the collar shape and drape, so this is a good start. I could add a little fish-eye dart on the roll-line, but I think it looks alright as it is. I also tried the flaps and pockets placement, just to check on the proportions. I may have to adjust the placement when the jacket is finished (the photo isn’t faithful because it was taken from chest height and at close range, which adds a little distortion). 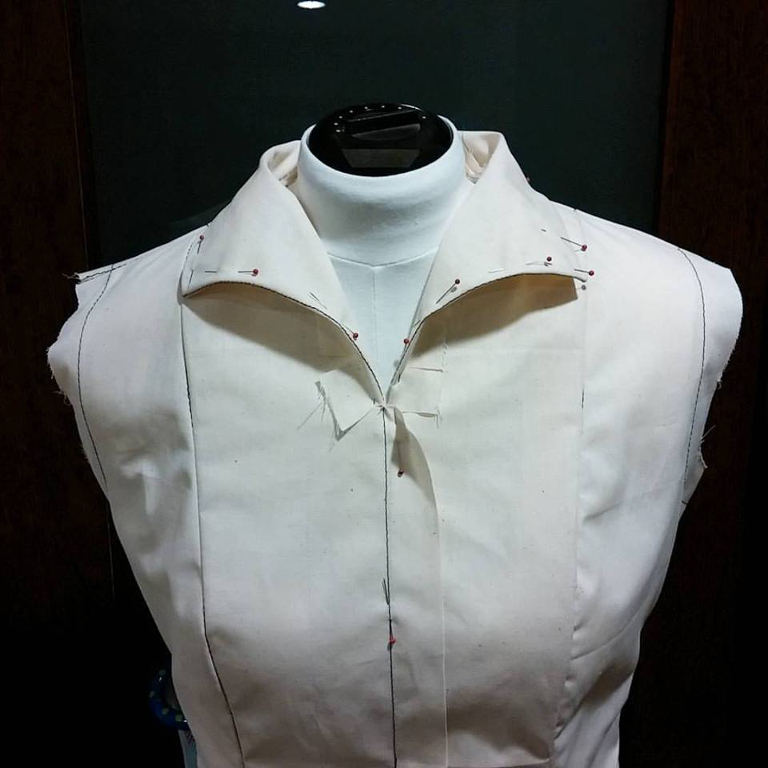 EN: Remember when I made the muslin for the Little Black Jacket that I had to adjust the shoulder seam lowering the bust point and consequently the armholes? The neckline came down a little bit but that was alright because the fringe trim would add that little extra height in the end. The armholes height was also altered. 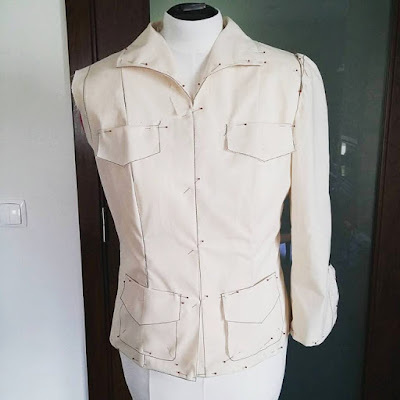 For this jacket I tried a different method to obtain the same result: I added that extra height slashing the pattern in the middle of the armhole, perpendicularly to the grainline and raised the armhole by the same amount, so it would keep its size. I also made a slight slopping shoulder adjustment on the right shoulder (lowering the armhole). The other adjustment I made was on the sleeves, taking in a little bit out of the seam that connects the front sleeve with the inner sleeve and making similar adjustments to what I did for the Little Black Jacket. PT: Lembram-se que quando fiz o modelo de prova da Little Black Jacket tive que libertar um pouco a costura dos ombros, baixando a linha do busto e em consequência também as cavas? Desta vez fiz o ajuste de forma diferente, cortando o molde em papel perpendicularmente ao correr do fio à altura do meio das cavas e acrescentando aí 1cm em altura, mas desta vez subindo também a linha inferior das cavas 1cm, para manterem o mesmo tamanho. Também fiz um ajuste muito ligeiro no ombro direito, descaindo-o (descendo toda a cava ligeiramente). O outro ajuste que fiz foi estreitar um pouco as mangas apertando a costura que une a parte da frente da manga com o painel interior. Além disso alterei a manga como fiz na Little Black Jacket. 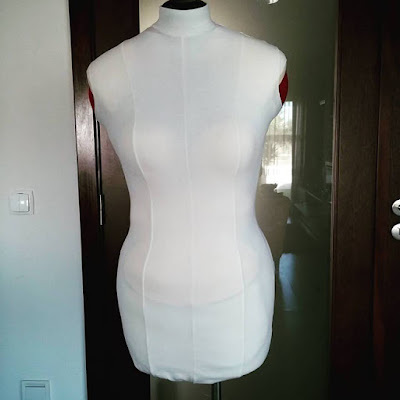 EN: So the muslin work is done, now I am taking it apart and will use it as a pattern for the fashion fabric. Stay tuned! PT: O modelo de prova está ajustado e provado, e agora vou desmanchá-lo para ser usado como molde no tecido da jaqueta. Até breve! Great post! This jacket is going to be as wonderful as the first. 40 minutes to put the dress form together is pretty good. I think it would take me forever! This new jacket looks very promising. Parece que vai ficar super bem!